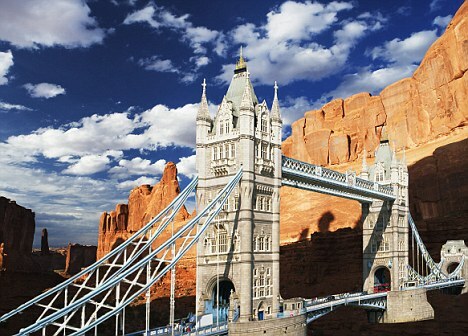 Utah Travel Headlines: Tower Bridge, A London Landmark, Coming to Utah? Tower Bridge, A London Landmark, Coming to Utah? London's Daily Mail chose Utah to figure prominently in this April Fools Day article, which is now being picked up as breaking news on websites around the world. It's a pretty good story, with a Utah billionaire buying London's Tower Bridge, intending to move it to St George to be the focal point of a new theme park named “Cruel Britannia”, a reconstruction of “medieval” London complete with high-speed thrill rides. The article included the photo above, showing the bridge photoshopped into a Moab landscape, suggesting that is how it might look in St George. It is one of the most iconic landmarks in a city of iconic landmarks, and a glorious relic of the Victorian age. But – in a move likely to enrage Londoners and stun the rest of Britain – Tower Bridge will vanish from the capital’s skyline later this year, sold to an American billionaire who plans to use it as the centrepiece of an ‘English theme park’. Mr Horwendill, 47, a former cattle rancher who has made his fortune in nuclear waste disposal, teenage beauty pageants and productions of Andrew Lloyd Webber musicals, is said to have been inspired to buy Tower Bridge after visiting Arizona, where the structure’s onetime neighbour London Bridge is set up as a tourist site. London Bridge was sold to Missourian oil magnate Robert McCulloch in 1968 at a cost of US$2.46million (£1.63million), and shipped piece by piece over the ocean. The bridge is now the star attraction at Lake Havasu City, where it sits in retirement by the lake of the same name, alongside a cluster of ‘Tudor-themed’ shops and restaurants. However, controversy has long been attached to the purchase of London Bridge, with popular legend suggesting that Mr McCulloch had intended to buy Tower Bridge rather than its flatter, more mundane colleague – and had confused the two structures. Gordon Brown has so far refused to make any comment on the matter, but the Queen was said to “really have the face on, ooh she was livid” when informed of the sale.